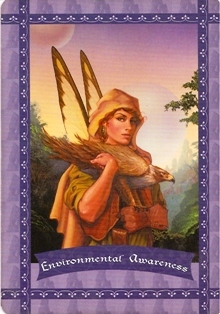 Intro: This is being extracted from my archives today in honor of the “Environmental Awareness” Fairy Oracle drawn in this morning’s Daily Dose. If I’m not mistaken, I wrote this when I lived in Tulsa, so about…. 6-8 years ago or so. 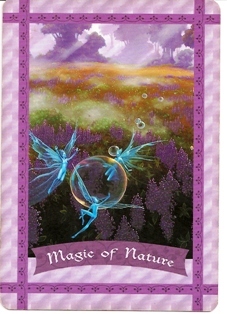 Drawing this card today doesn’t surprise me, especially since I’m going out looking for new places to live. Not long ago, we’d talked about leaving Kentucky all together, and the very thought of it broke my heart. I love Kentucky. The idea of moving back to Las Vegas was mentioned, but I immediately knew that wouldn’t happen. I can’t live in the desert. I can’t live in a place that’s overly industrialized. I’m a nature girl. I need the great outdoors. I need big trees, a variety of flowers, lots of critters, four seasons. This is where I thrive. The other night, I as I was drifting to sleep, I was chatty in that half-sleep kind of way, drifting on dreams of my new home. I said I hope there’s a space I can set up an office, with a window facing east. I hope that window facing east provides a view of trees, a woodsy spot. I love to sit in my desk chair, stare out the window, and get lost in the landscape of dreams. Environmental awareness also asks that we stay attuned to the animals and the messages they bring to us, just like I did the other day when Crow was cawing at my sliding glass door, or when the raccoon ran across the road (which I didn’t post here) and I came home and immediately looked up his meaning in my books. Animals speak to us… this card asks that we listen. This card also asks that we do our part, if not a bit extra, in preserving the environment in which we live – such as taking up recycling, eliminating products that are harmful to the atmosphere, protecting wildlife, and things of that nature. Long story short? Choose my home carefully based on the environment it’s in, pay attention to the signs the environment is offering, and protect the environment while I’m at it. Definition: You have th epower to make a huge impact on our planet. Earth is a living, breathing being, and the fairies are calling upon you to help her. Your contributions could include recycling, picking up trash while on your nature walk, switching to environmentally friendly cleaning products, becoming a vegetarian, or educating your children about the fragility of nature.